Q – What Is Memorialization? A – Memorialization is the art of commemorating the lives of those loved, revered and respected. In all civilizations and generations, it has been desired to remember loved ones by erecting monuments. From pyramids to Indian burial mounds, public memorials such as Mt. Rushmore to simple private memorials, the creation of a monument has been the most common form of remembrance. A monument should last forever and the purchase of one should be made with great care and consideration. Granite and bronze are the most commonly used for monuments due to their durability, hardness and natural beauty. Q – How long does it take to have a Monument made? A – Completion time can vary on a number of factors but most are completed and installed 6-8 weeks after an order is made. Factors that influence the completion date are type of granite, complexity of the design and customization, weather, distance, time of year, foundation installation and whether or not it is in stock. During the 6-8 weeks many things are happening. A proof is made up and must be approved, the foundation is ordered and poured, and the monument is manufactured and finally delivered and installed. Some import colored granites that we do not have in stock or are very unique and custom in style can take longer than 6-8 weeks. These generally take 12-16 weeks. 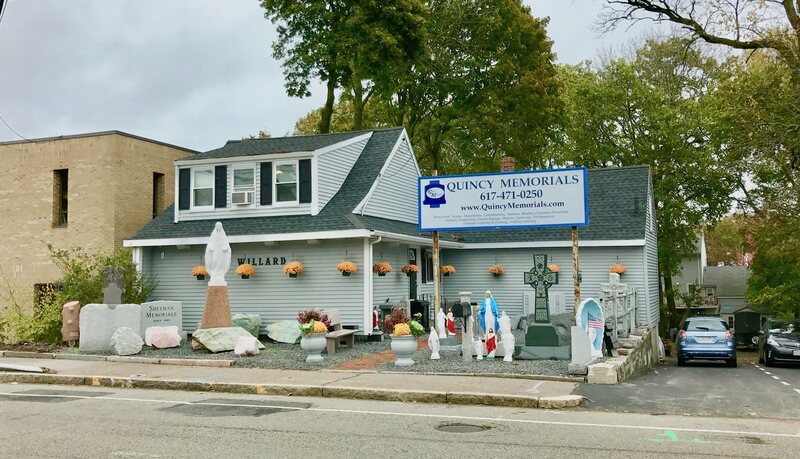 Quincy Memorials will do our best to give you realistic time expectancy. On the other hand, we can often times have a stone done in less than 8 weeks if a stone is picked from our display. This cuts time off production and delivery and we can often have these done in 6 weeks. This all depends on how fast the cemetery can have the foundation ready of course. Q – What if I need a monument of engraving done before the usual lead time? A – We can sometimes accommodate if the request is reasonable but we do not guarantee as factors beyond our control can delay completion. In some case there may be an expedite charge. Q – How much does a monument cost? A – This is a very loaded question as there are many things that influence the price of a monument. It is like asking how much a car costs or a house as there are many different types and options to choose from. Type, size, color, shape, polish, carving/design, wording, fonts, and add-ons all can influence how much a monument will be. There are options under $1000 (flat markers) to as much as you want to spend (mausoleum) Go to http://quincymemorials.com/info-center/pricing/ for more on pricing factors. Q – How do I find out what size restrictions and regulations there are for my lot? A – The cemetery has this information and sometimes they give something to you upon purchase that states rules, regulations and restrictions. If you do not have anything, call the cemetery or bring the deed to us and we can most likely help you. Q – What is a foundation, how much is it, and do I have to contact the cemetery? A – A foundation is often required by the cemetery to be placed under the monument so that it does not sink or tip over. If you go to older parts of cemeteries, they did not always require them and you can tell by how un-level some of them look. 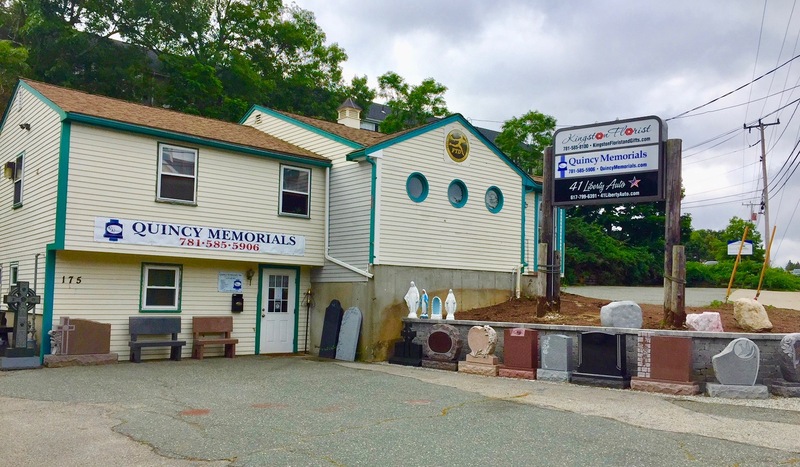 The cemetery more often than not puts the foundation in and pricing can vary depending on the cemetery. Foundations can be anywhere from $50 – $300/ft in length of base. Foundations should be the length of the base of the monument and should go at least a little deeper than the frost line. QMI will break out this charge on the agreement and handle any payments and forms that need to be done in order to get a proper foundation placed. Q – Do I have to purchase a monument or engraving from the cemetery or funeral home? A – NO. Regardless of what the cemetery or funeral home says you have the right to purchase from a company of your choice. The benefit of buying from a memorial retailer is they are focused on just memorialization. Like any product, the more focused a company is on something the more attention, knowledge, and options they will offer. Q – Why are the winter months still a good time to purchase a monument? A – Monument dealers in the New England are much less busy in the months of December-February. It is true that in most cases a monument cannot be installed during parts of these months, but that does not mean you should not purchase during these months. Your memorial, because it is during a slower time will gain extra attention and will be one of the first to be installed come early spring. 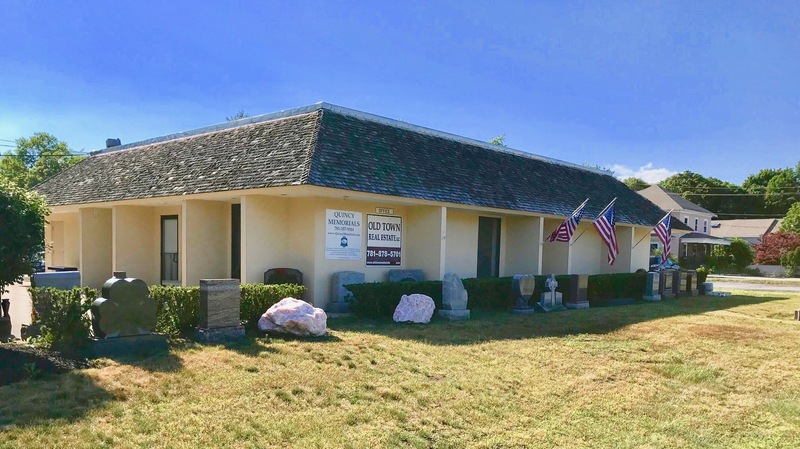 The weeks leading up to Memorial Day are very busy, so the earlier a stone is ordered the better chance it will be able to be installed for Memorial Day. During these slower months you may even be able to get a better deal as many places have inventory sales to make room for newer designs in the spring. If money is an issue, many places will take smaller deposits during these months and you can pay a bit at a time instead of one big deposit. It is important to keep in mind that it may make financial sense to purchase during the winter, but if you and your family are not ready emotionally, it is best to wait. If you know what you want, can put down a deposit, and would like peace of mind, winter can be a great time to purchase a monument. Although it may take a little longer than in the Spring, Summer and Fall, engraving can be done during the winter if it is not too cold for the machinery and there is access. Q – How long after a burial do I have to wait to purchase a monument for a lot? A – The nest answer to this question is, when you are ready. The cemetery may ask that you wait until the ground settles, but the 6-8 week process is more than enough time to allow settling. Most people will purchase at some point within the first year after a death but there are many things after a death that may take up someone’s time and money before they are even emotionally ready. Q – How will I know what I design is what I want before it is installed. A – Before the monument is actually produced, Quincy Memorials will do it’s best to give you to scale drawing of the shape, designs and lettering as well as show you samples and pictures of expected color. Changes can be made until a final proof is signed and approved. Q – Can Quincy Memorials deliver out of state? A – In most cases yes, as we have a network of reputable Monument Builders that we can contact to install a monument that we produced. Generally we service within the Rt. 495 belt of Massachusetts, but we have delivered to surrounding states as well. Q – How long does it take to have engraving completed to a stone that is already in a cemetery? A – Generally we complete engraving within 4 weeks of an order. However, weather, distance, time of the year and customization can delay. Q – Does my stone need to be removed in order to complete engraving to a stone already in a cemetery? A – NO. Engraving is done on-site and almost never requires removal to complete. Go to http://quincymemorials.com/info-center/the-cemetery-lettering-process/ for more information on how lettering is done at a cemetery. Q – If I purchase a monument prior to my death, who will take care of adding my final death date? A – QMI recommends that you give the folder with all the details of the monument, proof and invoice to whoever will handle your final arrangements when that times comes. They will have to contact us to add the engraving. We have every file from when we originally opened so we should be able to find the file and know exactly what we need to do. Q – How much of a deposit is required and what are my payment options? A – For monuments QMI will require about half of the monument plus the cemetery fees and tax. The rest will be due once the stone has been installed. For engraving to an existing monument and any other services, we require full payment upfront. QMI accepts Cash, Check or Charge (Visa, MasterCard, & Discover). If special payment options are requested we can usually accommodate. Q – Do you have a guarantee? A – Yes, we guarantee our granites not to fade or crack from exposure to weather. We also guarantee to remedy any defects due to materiel or workmanship or replace if needed. Coloring, lithocrome and gold leaf are not guaranteed as weather and forces out of our control can lessen the life of these add-ons.